The Delta Works in Zeeland have provided safe inland waters that now have a flourishing water-based tourism, generating the need for large-scale holiday parks. Architect and real estate developer Matthijs Zeelenberg, with Port Zélande, Port Greve and De Banjaard to his name, is the most important designer of such recreation villages. De Banjaard consists of over 500 deluxe properties for sale and rent on eight winding streets round a centre of shops, a restaurant and a swimming pool. 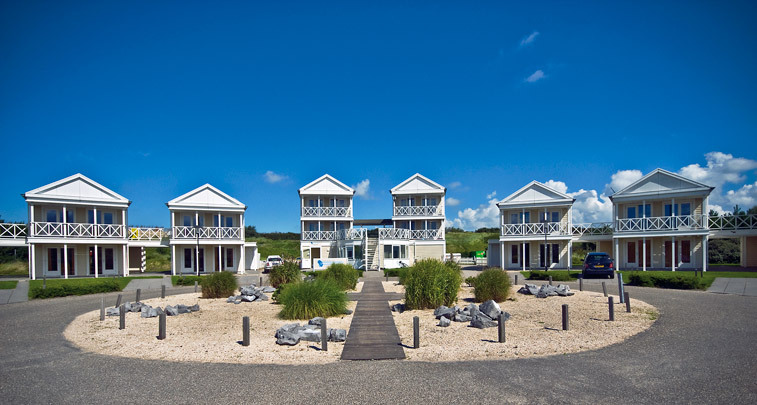 The standardized villas are in a Western European beach style of pastel hues and red roofs. Synthetic materials abound, low-maintenance and able to withstand the aggressive sea climate. The gardens contain dune vegetation.